The Leaning Tower of Paperbacks is no more. Today during breaks in the writing, I did some rearranging in the studio and moved in a couple of sets of shelves that I salvaged from a barn at my folks' place and cleaned up. I moved all the paperbacks from the stacks behind my chair and put them on the shelves, even sorted them by genre so that maybe if I go to look for something, I can actually find it. (What a concept!) Of course, there are still some pulps and digest magazines and research books stacked behind my chair, but not high enough to fall over. And there are other stacks of paperbacks that need to be put up, too. But at least I won't get pelted by falling books anymore . . . until I have a chance to build up the stacks again. They say bad things come in threes, and following the deaths of Don Knotts and Darren McGavin comes word that Dennis Weaver has passed away. When I was a kid, Saturday evening in my house meant HAVE GUN WILL TRAVEL at 8:30, followed by GUNSMOKE at 9:00. I remember vividly watching the half-hour, black-and-white episodes of GUNSMOKE that featured Weaver as Deputy Chester Goode. One of the on-line obits of Weaver that I read referred to the character as "slow-witted", which I don't agree with at all. Chester wasn't dumb. Following GUNSMOKE, I remember Weaver in GENTLE BEN and then McCLOUD, and I thought he was great in his role as a rancher in the mini-series version of James Michener's novel CENTENNIAL. When I became a film buff and watched Orson Welles' TOUCH OF EVIL, it was hard to believe that the crazed character Weaver played in that movie was the same actor as good old Chester. I had another connection with Dennis Weaver, too, besides just watching him on TV and enjoying his work there. He had a half-brother who lived in the town where I grew up, and the half-brother was one of my dad's regular TV repair customers. So my dad, on several occasions, met Dennis Weaver while fixing the half-brother's TV, whenever Weaver would be in town visiting. To a kid, that was mighty impressive, having a father who had actually met Chester. I hope this is the last old TV star we lose for a while. But it probably won't be. Some of you may remember me posting a while back about the Leaning Tower of Paperbacks in my studio. Actually, there are four stacks of mostly paperbacks, plus a few digest magazines and trade paperbacks, piled rather precariously behind my computer chair. Well, this afternoon while I was busy creating deathless prose, a couple of the stacks suddenly shifted for no apparent reason and started raining books down on my head and keyboard. Once I got over being startled, I found this funny for some reason and had to laugh about it for a while. Livia used to use a graphic on our stationery, business cards, etc., that showed a pair of legs sticking out from under a huge pile of books. That was almost what we had this afternoon. After a couple of minutes, of course, I stopped laughing, picked up all the books, and restacked them in what I hope is a more stable fashion. And as usual while I was doing that, I noticed books that I'd forgotten I owned. I really have to get all those books read and put up. Just one of the occupational hazards of being a book hoarder, I guess. As a child of the Fifties and Sixties, I watched a lot of TV. So it always saddens me to hear that stars from that era have passed away, as both Don Knotts and Darren McGavin did today. We never missed THE ANDY GRIFFITH SHOW when I was growing up, and I always enjoyed watching Don Knotts playing Barney Fife. Later, after he left the series and started making movies, I remember walking to the Eagle Drive-In Theater and watching him in THE INCREDIBLE MR. LIMPET and especially THE GHOST AND MR. CHICKEN, which I saw several times over the years because the theater kept showing it on Merchant's Night (the one night a week during the summer when you could get in free with tickets that were given away at various businesses in town). Still later, in the early days of our marriage, Livia and I would usually watch THREE'S COMPANY, and while Ralph Furley was no Barney Fife, it was still good to see him working again. Darren McGavin is probably best known for THE NIGHT STALKER, a show I liked and watched regularly, but my memories of him go back to a late Fifties Western series called RIVERBOAT, which also starred a very young Burt Reynolds. I think I saw him before that in the syndicated version of MIKE HAMMER, but I'm not sure about that. Some years later McGavin returned to playing a private eye for one season in THE OUTSIDER, which was created by Roy Huggins and is regarded by some as a sort of dry-run for THE ROCKFORD FILES. McGavin's David Ross was considerably more serious than James Garner's Rockford, or at least that's the way I remember the character. That series was also the basis for a very good tie-in novel by Lou Cameron. To me, though, even more than Mike Hammer or Kolchak, Darren McGavin will always be Ralphie's dad in A CHRISTMAS STORY, one of my favorite movies. "A major award!" Both of these guys did great work, and they'll be missed. Behind the pseudonym Louis Masterson was really Norwegian author Kjell Hallbing (1934 - 2004), who wrote over eighty Western novels about U.S. 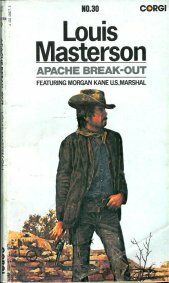 Marshal Morgan Kane. For many years the market for American-style Westerns was quite strong in Norway and the other Scandanavian countries, and Hallbing was probably the most popular Western author in that part of the world. The Morgan Kane series was reprinted in English translations by the British publisher Corgi Books. Over the years I've run across a handful of the Corgi editions of the Kane novels. APACHE BREAKOUT is the final one I own that I hadn't read until now. I didn't really like the other Morgan Kane books that I've read. The historical and geographic accuracy in them was pretty lacking. APACHE BREAKOUT is a significant improvement, though, a decent, action-packed Western about Kane's attempt to find out who is smuggling guns and liquor to renegade Apaches led by Geronimo. His job is complicated along the way by a beautiful redheaded female reporter and assorted villains. The plot is standard stuff, but the book moves along briskly and has good action scenes. The translation is by veteran American paperbacker Jeff Wallmann, which probably helped matters. I'm no expert on translating novels from one language to another, but Wallmann knows his way around a Western. I've been told that there is strong book-to-book continuity in the Kane series and that they're best read in order. Having read only scattered titles, I can't say whether that's true or not. I can say that Kane is an interesting character. He suffers some physically but even more so emotionally, and is plagued by more self-doubts and other human failings than many Western heroes are. I'm glad I finally read this one. I probably won't be searching out more Morgan Kane books, but if I happen to find any, I'll certainly pick them up and read them. Nobody else writes Westerns quite like Ed Gorman. First of all, he's the true heir to H.A. DeRosso, crafting bleak, noirish stories that are heavily tinged with tragedy. Also, there's very little of the mythological about Gorman's Westerns. They're so realistic you feel like they actually could have happened. And his characters are some of the best in the business, developed so fully and expertly that the reader can almost feel some sympathy for even the most unsympathetic of them. 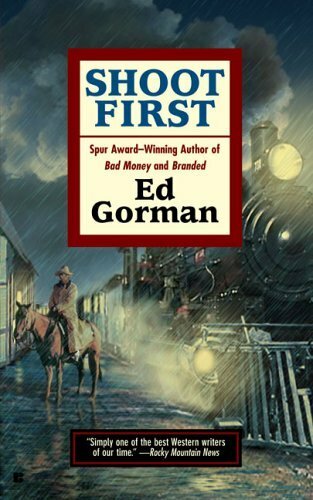 SHOOT FIRST, Ed's latest Western, is a fine example of his work in that genre. It's the story of four wealthy, powerful men in Butte City, Colorado, who share a dark secret; the man who knows that secret and seeks to exploit it; and the sheriff who has to cope with the inevitable violent repercussions once that secret begins to come out. Things aren't quite what they seem, though, or what the reader expects, because Ed springs some nice plot twists along the way and creates a lot of genuine suspense. This is a fine book, and I highly recommend it. So, Livia is reading a book by a highly regarded, bestselling, multiple-award-winning author, and she comes across the following line of dialogue: "He had to surrender his passport. So how could he go to Texas?" Now, since this is dialogue, you could make the argument that the guy who's saying it is supposed to be a little dense. But that's not the case, and none of the other characters point out to him that, uh, Texas is part of the United States. You don't have to show your passport when you cross the Red River from Oklahoma. If any of you are interested in taking a look at the house where I grew up, it's for sale and you can see it on the Buy Owner website and even take a virtual tour of the place. I've spent a lot of time over the past couple of months helping to move stuff out of there, but that's finally just about done. We moved into the house when I was two weeks old, and I lived there until Livia and I got married. I'm especially fond of the pictures of the front and back yards, because that's where I truly began my writing career, making up stories to go with all the running around and pretending to shoot each other that the other neighborhood kids and I were doing. I'm not sure why it is, but most of the movies we like seem to be the ones that most critics don't like. Today we watched the DVD of INTO THE BLUE, a little adventure movie about hunting for sunken treasure in the Bahamas, and enjoyed it quite a bit. Sure, it's what some people call a popcorn movie, with no ambitions other than entertainment, but hey, entertaining people isn't all that easy. In INTO THE BLUE you've got your bright colors and pretty scenery, a stalwart hero (Paul Walker) and his beautiful girlfriend (Jessica Alba), a goofy, troublemaking sidekick (Scott Caan), and another beautiful girl who's probably not any better than she has to be (Ashley Scott). Throw in some dastardly villains, some sharks, and lots of underwater photography, and I found it a perfectly fine way to spend a couple of hours. Available from Wildside Press, this is a reprint of a novel that originally appeared as a four-part serial in THE THRILL BOOK in July and August of 1919. 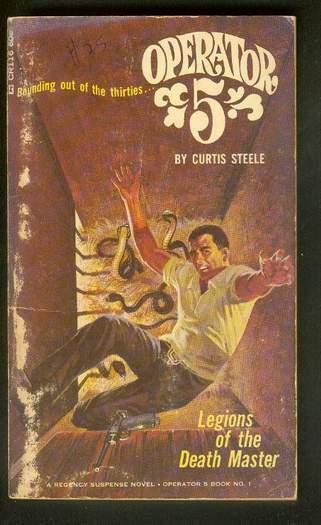 As I’ve said on other occasions, Bedford-Jones is one of my favorite pulp authors. This is one of his sea-going yarns, about a couple of financially strapped Irishmen, former aviator Gerald Desmond and consumptive fiddler Michael Terence O’Sullivan, who wind up being shanghaied onto a ship where all sorts of deviltry and double-crossing is going on. Between mutiny, opium smugglers, a hurricane, a couple of shipwrecks, two beautiful women in danger, and adventures on a deserted island, the pace never lets up for very long. Bedford-Jones keeps the story galloping along in his usual clean, spare prose (anybody who claims that all pulp fiction was overwritten must have never read Bedford-Jones) and throws in several surprising plot twists along the way. 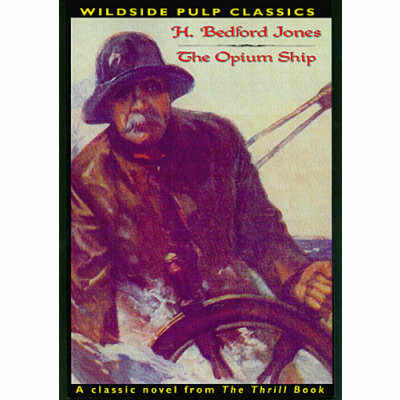 While THE OPIUM SHIP probably doesn’t belong in the top rank of Bedford-Jones’s work, it’s very entertaining and well worth reading. I had planned to start working on a short story yesterday, but I postponed it for a day because I had to do some work outdoors and yesterday was the last day of nice weather for a while. Thought I'd better get the outdoor stuff done while I could. So this morning I sat down at the computer with a pretty good idea of what I wanted to write, pulled out the research books to check on a few details, and then realized that the story I had in mind just didn't work. Not even remotely historically possible. Now, I don't mind stretching the facts a little when I need to, but I think a story set in a widely recognized historical setting (World War I, in this case) should at least be feasible, even when it's a fantasy. So I've scrapped that plot idea and am now starting over, letting things percolate in my head for a few days. But of course, since I couldn't waste the day, I started the next novel, a pseudonymous mountain man epic. I'll work on it until I get the short story figured out in my head, then take a little time off to write it. Also, an editor approached me today about the possibility of doing a new series, so I need to do some thinking about that and some research for it over the weekend. It gets a little confusing at times, but I actually like it when a lot is going on with the work. And it's going to be cold all weekend (cold for Texas, at least), so what else do I have to do? I finished a book today (#187, if you're keeping count, and you know me -- I always keep count) and emailed it to the editor. It was a week late, which I know is not much in this business, but it always bothers me to miss a deadline. I resolve to do better next time, but real life has a habit of interfering, especially here lately. Tomorrow I plan to take the day off, and then Thursday I'm going to start working on one of those short stories I mentioned the other day. If it goes well I'll be working on the next novel by this weekend. One thing I noticed pretty quickly about the HardCase Crime line is that most of the older books they chose to reprint I already owned in the original editions. (Great minds, etc., etc.) Here's another one that was reprinted by HCC that's been on my shelves for many years, unread. I've remedied that, and had a great time doing it. 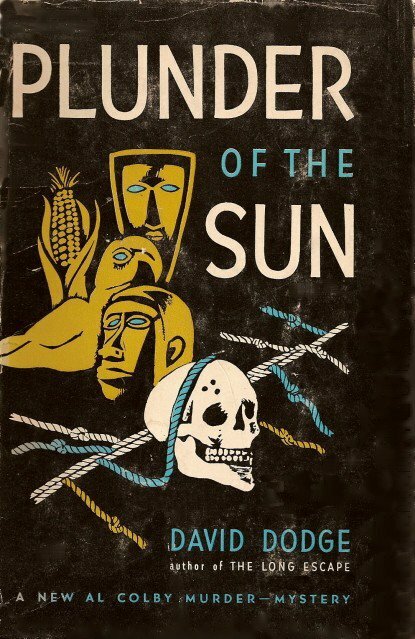 Al Colby is an American adventurer knocking around South America, and when he's hired to transport a suspicious package from Chile to Peru, you just know things aren't going to go well. They don't, and Colby finds himself plunged into a dangerous hunt for the long-lost treasure of the Incas. 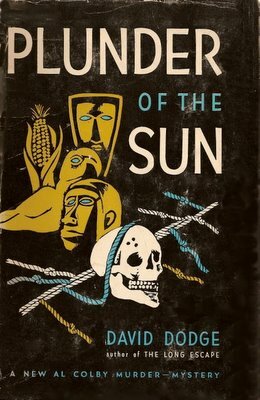 Despite what the dust jacket of the 1949 Random House edition claims, PLUNDER OF THE SUN isn't really a murder mystery. As others have said, it's pretty much a straight-ahead adventure story, and a good one. Dodge wrote very smooth, fast-moving prose and had a sure hand with his settings and characters. The only problem I had with the book is a somewhat anticlimactic ending. I've never read anything by him before, but I have at least one more of his novels on my shelves and will be digging it out soon. I had almost no interest in this year's Super Bowl. I was sort of rooting for Seattle, but only because I don't like the Steelers. But I don't really care about the outcome and didn't watch any of the game except the last minute or so. (We were waiting for GRAY'S ANATOMY to start.) Earlier in the evening we watched the DVD of WEDDING CRASHERS, which I liked quite a bit. Sure, it was a little crude in places, but its heart was in the right place. Last night we watched THE LEGEND OF ZORRO, which I was prepared to dislike because I know quite a few people who liked the first one with Banderas but not this one. I thought it was okay. The anachronisms bothered me quite a bit -- come on, a Henry rifle in 1850? -- but the movie looked good and had some nice stunts. Although I never trust stunts as much as I used to, because I always wonder if they've been CGI-augmented. When Yakima Canutt jumped a horse off a cliff, you know he really jumped a horse off a cliff. Here's the cover of the paperback reprint mentioned in the post below. I misremembered a few things about it -- I forgot about the Luger and got the cover copy in the wrong place -- but hey, I remembered where I bought it, and very distinctly, too. Not bad for something that happened nearly forty years ago. 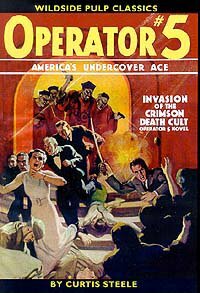 I just finished reading the Wildside Press reprint edition of this pulp novel from the September 1935 issue of OPERATOR 5. It's the usual mix from a Popular Publications hero pulp: a mysterious villain with a terrible new weapon lays waste to the country, kills thousands of people, and drives our stalwart hero (in this case, Jimmy Christopher, also known as Operator 5 of the American Intelligence Service) to the brink of madness before the villain's evil plan is finally thwarted. The same thing happened month after month, not only in the Operator 5 series but also in Popular's top-of-the-line hero pulp, THE SPIDER. And you either love it or you don't. I think you can guess which category I fall into.